Another Arab Spring or a wave of global chaos? 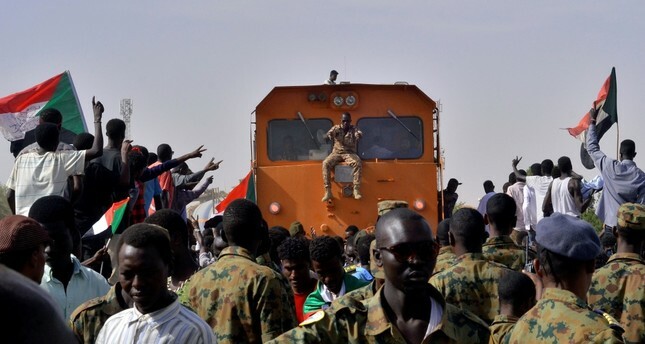 Sudanese military and demonstrators attending a sit-in block a train from passing through, during a protest outside the Defence Ministry in Khartoum, Sudan, April 14, 2019. Thousands of demonstrators took to the streets of Budapest at the end of 2018 after Hungarian deputies voted in favor of the so-called "slave law," an amendment to the country's labor law. The change allows employers to ask staff to work up to 400 extra hours per year of overtime, compared with the current limit of 250. In addition, they also protested a new law that will see the setting-up of administrative courts overseen directly by the justice minister. In one of the series of gatherings, Hungarians protested in front of the state television building, uniting a fragmented opposition against right-wing Prime Minister Viktor Orban's policies. They demanded independent public media and courts. Meanwhile, tens of thousands have been demonstrating in Serbia for around five months against President Aleksandar Vucic. Critics accuse Vucic of stifling hard-won democratic freedoms under the banner "One in 5 Million" – a reference to a comment Vucic made last December when he vowed never to back down, even if 5 million people took to the streets. Thousands have marched through Montenegro's capital, Podgorica, to call for the end of President Milo Dukanovic's 30-year rule. Montenegrins have been protesting since Feb. 2, on the initiative of a grassroots group called "Odupri se – 97000" ("Resist – 97000"), including activists and citizens with no clear political affiliation. During anti-government clashes in Albania, opposition supporters broke through a police cordon and smashed on the doors of Prime Minister Edi Rama's headquarters in Tirana. They threw petrol bombs and flares calling on Rama to step down. In Greece, thousands have protested a deal with the neighboring Republic of Macedonia (now known as North Macedonia) about the country's name. Around 60,000 demonstrators gathered in Syntagma Square, outside parliament, chanting slogans: "Macedonia is Greek." Is this a Balkan Spring? Is this a Balkan Spring? No one said or thought so. And probably it is not since it is not only in the Balkans, there have been many protests out on the streets in other parts of Europe. Last month, tens of thousands demonstrated calling "People First" in Milan against all forms and discrimination against the populist government's policies, which promote racism. In addition, shepherds from the Italian island of Sardinia chose to spill their milk to protest the recent fall in prices. Minor protests like this are happening every day in Italy. Then in Brussels, protesters recently rallied against a U.N. migration act. They took to the streets of Brussels since the Global Compact on Migration was adopted by 164 U.N. members, in an aim to improve the treatment of migrants worldwide. The U.N. Global Act for Migration is actually promoting safe and legal migration. However, the U.S. and some European countries have rejected the pact. The critics claim that the pact could limit individual countries' ability to shape their own migrant policies. Belgian police used water cannons and tear gas to disperse crowds near the European Commission. And of course, there are France's "yellow vest" protests which started in November 2018 and are still continuing. French protesters took to the streets for 22 straight weekends, rejecting measures to be unveiled by French President Emmanuel Macron, which include controversial fuel tax hikes, leading to clashes with police in Toulouse. French televisions show that police used tear gas and water cannons to keep demonstrators out of the city center. Parts of Paris and some regional cities were declared off-limits to protesters following looting and violence at the end of March when anarchists sacked and burned stores and restaurants on the Champs-Elysees. Around 31,000 yellow vest protesters turned out across France, including about 5,000 in Paris, according to Interior Ministry figures cited by the news agencies. Yellow vest protests have quickly spread across other countries such as Canada and Spain. In Canada, some protesters blasted a lack of freedom of speech in the country in addition to protesting the U.N. Migration Act. Inspired by the rallies in France and marched in Madrid, Spanish protesters asked for better pensions. In the meantime, thousands of Catalans hit Barcelona's streets as Spain's government held an "away da" cabinet meeting in the city. People blocked roads and clashed with police in the Catalan capital. In London, hundreds of protesters joined a "yellow vest-inspired" anti-austerity march through central London in a demonstration, which has been calling for a general election. Anti-government protesters wearing yellow jackets called on Prime Minister Theresa May to resign because of her government's massive cuts to welfare, education, health service and more. In Trafalgar Square, some of them clashed with pro-Brexit protesters, who were also wearing yellow vests. I did not even write about pro-Trump and anti-Trump protests in the U.S. However, even in Israel, yellow vest protesters demonstrated on the streets against the high cost of living. People in fluorescent-yellow safety vests holding Israeli flags, megaphones and signs on a central street in the coastal city protested living standards and Netanyahu's corruption scandal. Protesters in Iraq, Bulgaria, Taiwan, Germany, the U.K. and other countries have taken to the streets in reflective yellow vests, too. In many countries, such as Portugal, police officers have been on alert with copycat demonstrators expected across the country. Organizers of Portugal mass protests have called the rallies "Coletes Amarelos," or "yellow vests of their own." Apart from Europe, in South Africa, protesters wearing yellow vests demonstrated against the low quality of public services. But in Africa, the protesters are silenced by the governments using internet shutdowns. Less than a month into 2019, the Democratic Republic of Congo, Gabon and Zimbabwe experienced government crackdowns on internet connections. There are more to count, but this page is limited, as you know. But, is it just me or are we back to the global 2010-11 protests? We witnessed an example of this eight years ago. The Occupy Wall Street movement, that began on Sept. 17, 2011, in Zuccotti Park in New York City, was a protest against inequality and the lack of democracy worldwide. The movement quickly spread, motivating thousands to voice their anger at financial and social inequality. On the Day of Rage in October 2011, demonstrations took place in more than 80 countries. From Munich to Seattle, Brussels, Tokyo, Seoul and even Alaska, there were street protests and grassroots campaigns, especially in Europe. The widely used slogan everywhere was, "We are the 99 percent." European cities were already hit by anti-austerity protests in 2010. Tens of thousands of people from around Europe marched across Brussels to protest spending cuts. While Spain held a general strike, protesters in Barcelona clashed with police, other protests against austerity measures were held in Greece, Italy, Spain, the Irish Republic and Latvia. Even the U.K. saw major demonstrations throughout 2011. However what most of the European governments and Brussels did was to target the working class by cutting wages and pensions, laying off thousands of workers, while big businesses and banks, which avoided paying taxes, were going unpunished. Although the main reason for the financial crisis and the subsequent recession worldwide was their greed. Unsurprisingly, the left wing in Portugal, the populist left-wing party of Podemos, the socialist Solidarity party in Ireland, Syriza in Greece and the Five Star Movement of Italy were the principal protest parties. But this time, it looks like far-left and far-right groups have united via the yellow vest movement instead of the regular middle class we know. People are angrier and becoming more and more skeptical about governments, institutions and others. For instance, the numbers of the Melenchonist (supporters of La France Insoumise, the far-left party) among the protesters is huge, while the reaction of Marine Le Pen's party (renamed the Rassemblement National) has been enthusiastic about the movement since the beginning. When the Tunisian Mohammed Bouazizi lit himself on fire Dec. 17, 2010, he sparked a domino effect in another continent and all eyes turned to the Middle East. Maybe Occupy Wall Street influenced the Arab Spring or otherwise. However, there is no doubt that both were caused by a global economic crisis, and based on inequality, unemployment, discrimination, poverty and the privileged 1 percent of the world. Today, it is still about those issues; however, the extremists are playing a bigger role this time, and they are putting the blame on immigrants and refugees. The extremists are either the governments and they are being protested against or they are protesting non-extremist governments. Recently, in Sudan, tens of thousands of demonstrators demanded the ouster of their longtime ruler. Last week, Sudan's transitional military council arrested members of the former government and promised not to disperse protesters. A spokesman also urged the opposition to pick the next prime minister and vowed to implement their choice. Months of protests in Sudan led to the ouster and arrest of long-time leader Omar al-Bashir on Thursday. Demonstrators have vowed to stay on the streets in Khartoum until there is an immediate move to civilian rule. Not only Sudan but also Algeria pushed out the long-serving ruler of the country after mass protests of Algerians. And in Libya, Khalifa Haftar is resuming his war to establish himself as the new dictator of the country after Moammar Gadhafi was killed eight years ago. According to Libyans, he will never be successful. Some say that the Arab Spring is coming back. People may take their lessons from Egypt, Syria and Yemen; but also, the old guards of the Middle East or the establishments of those countries in North Africa will not be eager to give ruling power to civilians so quickly. The Algerian army may have forced an end to President Abdelaziz Bouteflika's 20-year rule to please the crowds, but Algerians are now facing the difficulty of challenging the corrupt system behind it all. And Khaftar's attempt to end the chaos in Libya by bringing new chaos recalls the unhappy outcomes of the uprisings in Egypt, Bahrain, Syria and Yemen. Will there be a new wave of Arab uprisings? Probably not. However, we can see global chaos due to the economic crises, trade wars, unemployment and system failures. All the problems stirred up in 2010-2011 are still here. People in Sudan ask for jobs, food and money, Algerians seek freedom and Libyans wants democracy. The Westerners silenced their protesters and united them against a common enemy using the terror of Daesh and al-Qaida as a poltergeist in 2012. The protesters in Europe and the U.S. have been alienated from the Arab world and non-white demonstrators. Some have started to lean toward white supremacists, extreme far-right and left-parties. When their governments stood side by side with the dictators in the Middle East and North Africa and even supported the coups, it was not surprising to see anti-Muslim sentiment among their society. In short, if we continue to see more protests in the West and more sit-ins in the region, it will not be a new Arab Spring, rather a new wave of global chaos.